Each of the more than 12,000,000 arrests made in the United States each year is documented in multiple ways, resulting in millions of pages of data regardless of whether the criminal arrest was for leaving the scene of an accident or robbing a bank. Arrest records for serious crimes certainly make up more of the volume than misdemeanors, but with approximately 1.6 million drug arrests a year, 1.4 million DUI arrests, 1.2 million arrests for larceny, and 1.2 million arrests for assaults, according to the Bureau of Justice Statistics, there's no shortage of documentation. Police establish probable cause through a combination of physical evidence and/or testimony. In many cases a warrant is required to arrest someone. 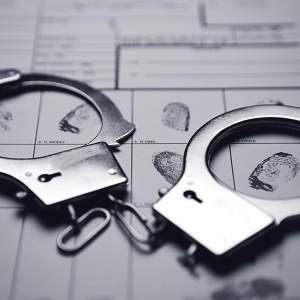 To obtain a warrant, police compile their case identifying a suspect, then seek the signature of a judge or magistrate on a warrant, which is a document approving the suspect's arrest. Once approved the warrant sits with the department that requested it until it is served. Other types of warrants include bench warrants for not showing up to a court date or responding to a subpoena, which is issued directly by the court and generally executed by sheriff's deputies. Miranda Rights is statement police must read to a suspect admonishing him that he may refuse to speak until he has the opportunity to consult with an attorney. Police are allowed to wait until a suspect in detention (arrested) is about to be interrogated before they are required to tell him he has the right to remain silent and are not required to warn a suspect that anything he says to them at any time prior to interrogation may be used as evidence in a criminal trial. Fingerprinting: Although it has been known for hundreds of years that fingerprints are almost unique to each individual the science of comparing fingerprint characteristics was not used by the military or in law enforcement until about World War II. Since that time, each arrestee and military recruit has been fingerprinted, creating a database of millions of records over time. Mug shot: Arrestees are photographed in the booking process and may include more than images of the face, including other major identifying marks on the body such as tattoos. Other police agencies have access to these images, as does the public. DNA: Many states require arrestees to submit to DNA sampling (providing a cheek swab) even for minor offenses. The use of DNA evidence is disputed but may be compared to a database to determine participation in other crimes. Search/Seizure: All items of clothing and personal effects that are with a suspect when arrested are often catalogued by police, particularly if the suspect is kept for an extended period of time in a cell. Clothing, handbags, backpacks and even body spaces are likely to be searched for drugs, weapons and stolen goods. Those that are legally the property of the detainee are held for return when he/she is released, but other items may become evidence or cause for further charges, as in the case of drug evidence. Warrants: A suspect's name and other identifying information including birthdate, aliases, and photos are shared and compared with other law enforcement entities in multiple jurisdictions to check for outstanding warrants issued by courts. Medical: Drug use and other health issues such as communicable diseases that may affect police or others held in the same facility are checked during a health screening done at the time of arrest. Bailor pretrial hearing: Once an arrest takes place, a judge decides whether the suspect gets released. Generally, suspects are held until local courts convene, oftentimes the next morning. The judge weighs the crime and considers potential penalties, deciding whether one can be released on his own recognizance, on bail pending a future court date (the court holds the money until the suspect returns) or if no bail is set because of the severity of the crime or other factors including multiple outstanding warrants. Most of the information gathered during a suspect's booking on suspicion of criminal wrongdoing is available to the individual involved as well as to the public, however police will withhold anything pertaining to an ongoing investigation (e.g. information linking the suspect to suspected crimes beyond those he has been arrested for) and any health information.